Forever Decorating! : Little Toile Stool & Funny Ad! 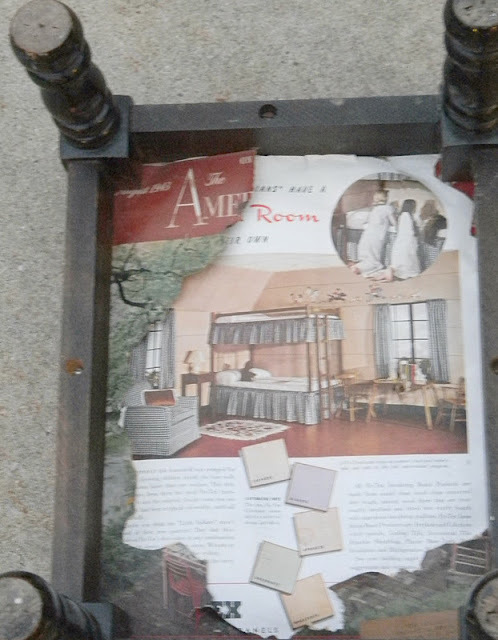 Little Toile Stool & Funny Ad! 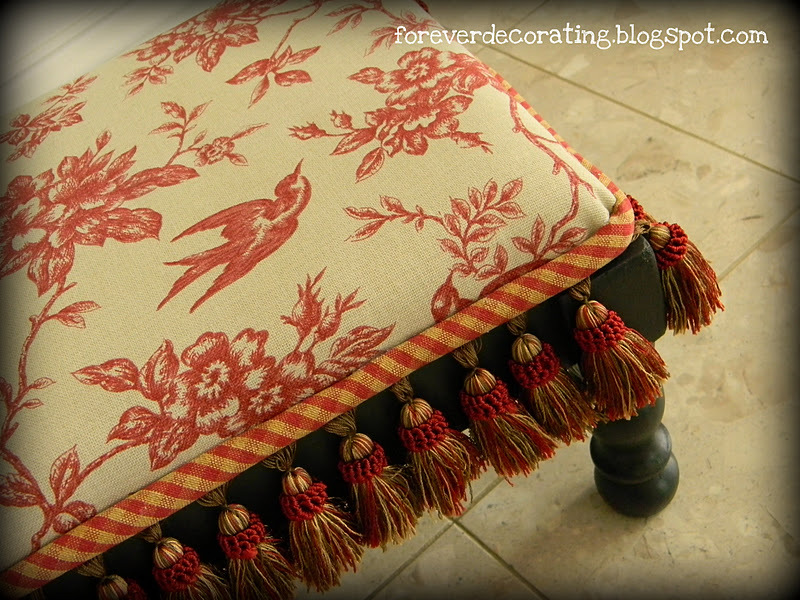 I have re-vamped a little stool with paint, tassel fringe and bird toile fabric. I think it turned out really cute and reflects my taste and style. This is how the stool looked when I acquire it. It was ragged and tired. I decided to try to use the needlepoint in a frame instead since the outer areas were worn. 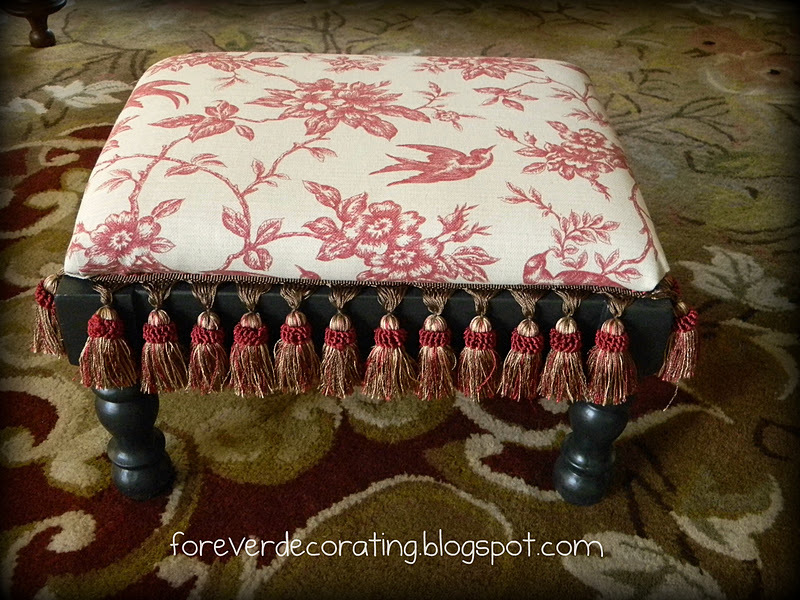 I painted the base a charcoal color and decided to jazz up the upholstery with the tassel fringe that I had on hand. On to the funny ad that was tacked to the under side of the original stool. Here is what it looked like. 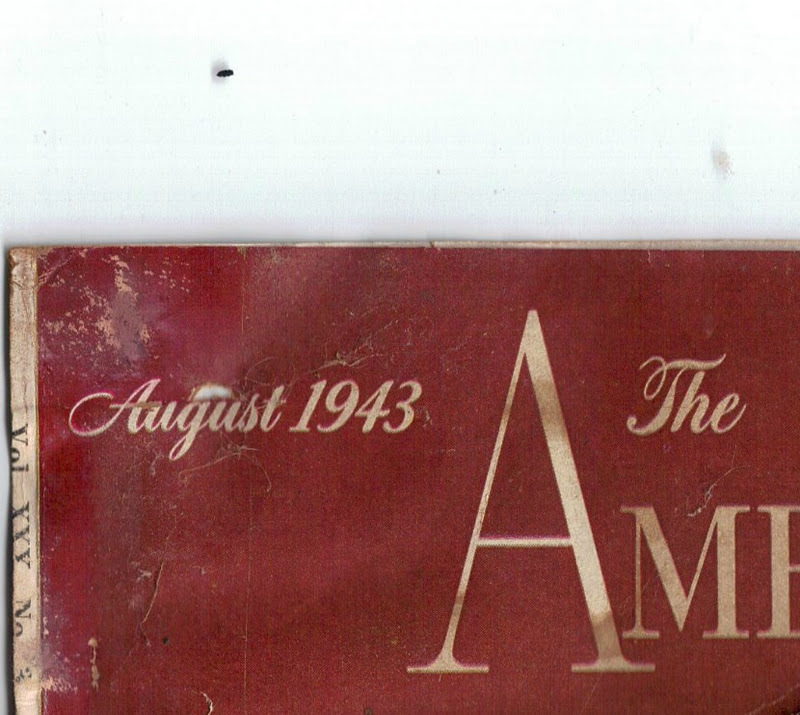 An August 1943 magazine cover with this ad below on the back. It is an ad for Ry-Krisp. It states to G,et rid of fat...pitch in, help win (the war)! Reduce the Ry-Krisp Way. It goes on to demonstrate three women. The second woman shows a lady behind a work desk for war ration books. It says, Mrs. D is slim. She cleans, shops, cooks, is a volunteer war worker. She stays slim and keeps in trim the Ry-Krisp way. Finally, the third one shows a woman at a dinner table. It says, Mrs. S has always been slim...and Ry-Krisp has always been her family's favorite bread because it tastes so good. That is just so adorable! I love that toile, with the fringe. 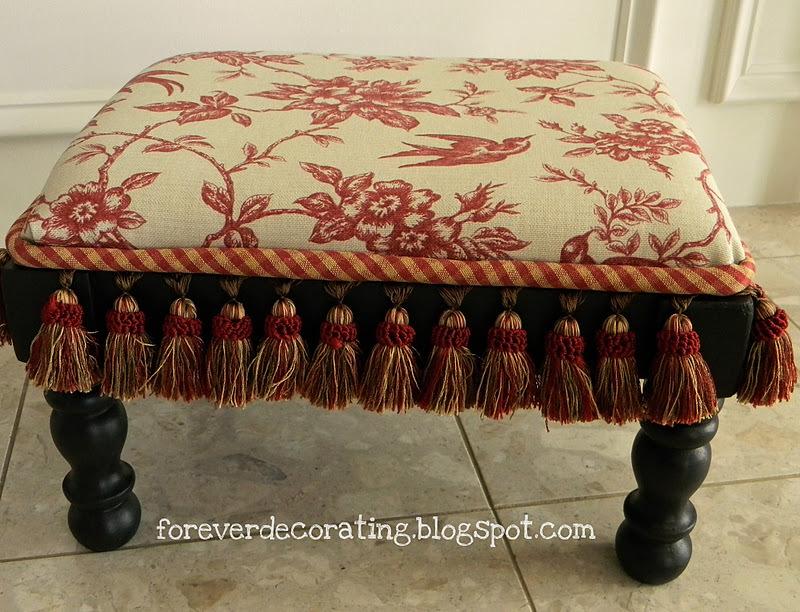 Great job on a charming little stool! The ad is a capital "H" for Hysterical! omg.... so glad times have changed. lol Your stool is adorable....especially love the trim. Your little stool turned out so cute. The old ad is funny. It sounds as though those crackers were the answer to losing weight! LOL! 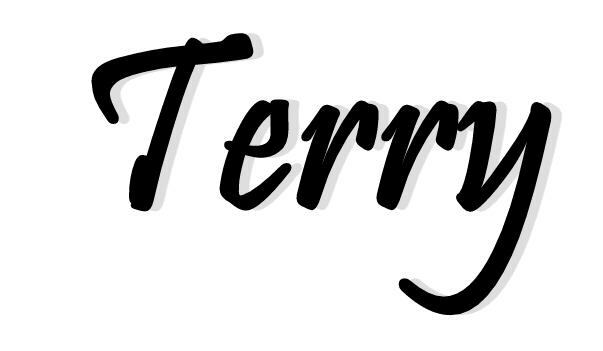 Love your little stool transformation, Terry! I have fabric I love just sitting waiting for the perfect project, too. This toile suits it perfectly and I love your tassel fringe! 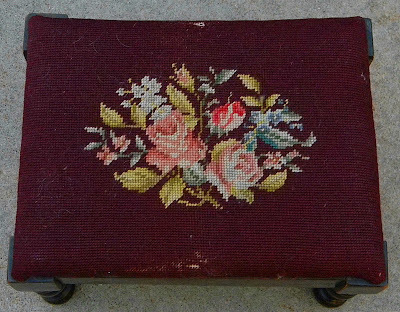 I love your toile footstool, Terry, it is gorgeous. You did a beautiful re-do on it. I look forward to returning to see more of your projects. I am now a follower and hope you will join my followers list as well and grab a blog button. Hugs, Gayle. Awesome post! It turned out great and gorgeous colours. Thanks for sharing. Gorgeous! And the old ad cracks me up! I guess I need Rye Crisp! Oh my, that stool turned out fantastic!!!! I loved the ad...gotta love the Ry-Krisp!!!!!! Thanks for visiting my blog. I love the stool. I too collect stools, foot or sit upon. I think I will go through my bins of fabric, for a quick fix. Funny ad, Terry, and great job on the stool. Terry what a find with the magazine ad! The stool is lovely too. I would frame the embroidery as well, and it turned out lovely. I have a bird pillow that is very similar, my fabric I believe is Waverly. Great transformation on the stool! I love anything with toile. Love the stool makeover and the ad is hilarious. The trim on the stool is perfect. Thanks for sharing at DIYbyDesign. Goodness, the ad certainly wouldn't go down well now! Hey I just wanted to let you know that I am featuring you today. That stool is so classy looking now! I have a little one similar to that, but I never really thought about putting fringe on it. Thanks for the idea. I could see that needlepoint pillow made into a pillow. Maybe cut it into an oval shape and add it to a background with trim and fringe--could be lovely! I really do love this stool. I will be featuring it tonight at my Fall into Fall party that opens at 8pm EST. Please stop by and pick up an I've Been Featured button. Thanks. That turned out beautifully. Good job. Thank you so much for sharing and linking up to our party Show and Share. Make sure to come back this week and link up your latest projects. We would love to see them. Week 26 ~ Diamonds In The Rough! Week 25 ~ Diamonds In The Rough! Week 24 ~ Diamonds In The Rough!